Words didn’t fall from the sky. They were coined. They contain histories. They are the landmark products of thought processes, the rest-signs of journeys. They move on, long after we die. They were something else centuries ago and they will be something else centuries from now as human being twist, turn, defined and redefine as appropriate to moment, place, culture and prerogative(s) at hand. "Sivhele to Sihale to Sinhale to Ceylon. No lion. No blood. No problem. I am a citizen of Sinhale." Whenever a majority in any social context flexes muscles minority entities become wary. This is a verifiable fact. Whether or not the muscle-flexing entity is justified in doing so (for example, as response-flex, let’s say) is a different matter. The bottom line is that anxiety levels rise. And it doesn’t have to be muscle-flexing either. Even a simple matter of identity assertion (again, for whatever reason, including response to in-your-face identity assertion by minority entities and continuous and pernicious name-calling and vilification) can send shivers up some backs and that's something to be worried about because things can grow and can be made to grow in grotesque ways even with the best of intentions. This seems to be what has happened to Jehan Perera and others over the sudden appearance of ‘Sinha-Le’ (literally ‘Blood of the Lion’) stickers. Jehan (see “‘Sinha Le’ hate campaign must be dealt with by new laws”), speaking for the National Peace Council, claims that the stickers was “a part of an organized political campaign that seeks to exploit nationalist emotions”. Nothing wrong in nationalist emotions of course, and they are exploited by all kinds of individuals and organizations, for example to promote products and position brands. The problem is not the sticker or the wording, but its associations with organizations that are racist and intolerant of other groups. There is also the problem of the word in its ahistorical break (i.e. Sinha-Le instead of Sinhale, ‘le’ meaning ‘blood’ and its depiction in red which is obviously associated with violence). There is legitimate anxiety which spills into fear and even fuels extremism (latent or otherwise) among other groups when the word, either in its integrity or break, is painted on the walls of buildings owned by or associated with those in other communities. That said, you really cannot ‘ban’ a word. You can indulge in ‘hate’ discourse with specific actions, ideological positions and intentions stated but when it comes to prohibition you are on shaky ground. If Jehan were to read the Bible and Quran he will realize that both texts are full of what he might call ‘hate speech’ far worse than anything so far uttered by those waving the ‘Sinha-Le’ flag, so to speak. Sure, such wording ideally has to be read and accepted in terms of the overall context in which they were spoken or written, but ‘bad wording’ is always ‘bad’ because frail human beings will read them out of context or draw them selectively. Like Jehan does. A quick example would help sort him out. Jehan claims, “The term “Sinhale” was used during the period of Western colonial invasion that began in the 16th century to represent that part of the country that remained free of colonial rule”. Is this ignorance or deliberate misrepresentation? Want to go back further? Well, way back in the 10th Century, Raja Raja 1, during whose time the Chola empire reached its zenith of glory, not only invaded but plundered and bragged about the plundering. The Archaeological Survey of India, for example, includes reference to inscriptions at various Hindu temples built with the wealth looted from lands conquered by Raja Raja 1. These inscriptions list the names of lands he conquered and refers to the island we today call Sri Lanka as ‘Ila-Mandalam’. ‘Ila’ is a corruption of ‘Hela’. 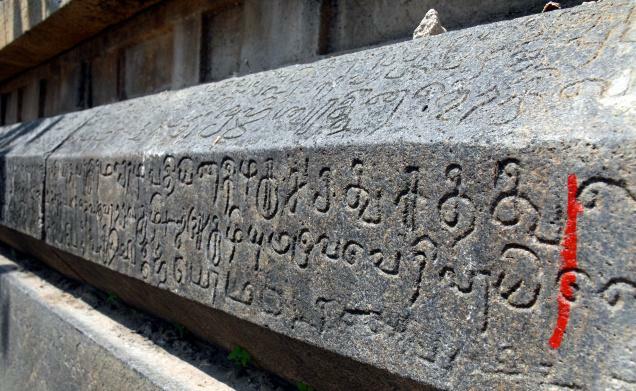 Another translation of a Raja Raja inscription has the island as ‘The land of the war-like Sinhalas’. There’s no sinhaya (lion) or le (blood) in ‘Sinhale’. It derives from ‘Hela’ and expands through the acknowledgement of the four constituent entities Yaksha, Naga, Deva and Raksha, each associated with a vocational sphere, and which therefore make up the siv (four) helas. Sivhela became Sinhala and its corruption gave us ‘Ceylon’. And that was long before the European invasions where Jehan would like to believe the noun was born and worse in marginal and fragmented form (“part of the country that remained free of colonial rule”). Now that kind of mangling of historical record is pernicious. If we use the liberties that Jehan avails himself of we might even call it ‘hate speech’! Vinod Moonesinghe offers a far more sober reading: “The Sinha-Le sticker was a fairly unobtrusive bit of identity-establishment, no different from those which say "Masha Allah" or "Jesus is King" or "Proud to be a Thomian". The inordinate attacks on them have made it into an issue, causing divisions where there were none. Most of the problem has been caused by people who don't realise that it is simply a meme. People don't actually, in this day and age, believe that they are descended from a lion, any more than people believe that they are descended from a couple called Adam and Eve who were made out of mud and dust. Sinhalese nationalism does not rely on the Mahawamsa story, but rather on the fusion of four tribes, the "Siu Hela" to form a single "Sihela" identity. Neither does it rely on a concept of race. Sinhaleseness is a cultural concept. After all, the kingdom of Sinhalay encompassed Tamils, Moors, Portuguese and whatnot. The last King of Sinhalay was Tamil. Every rebellion until 1848 had a Tamil pretender. The Sinha+Le, quite apart from being an ahistorical postulate, as Jehan has correctly pointed out, has intimidating overtones (even if there was no vandalism involved). Using that to mis-define and footnote (or even dismiss) the ‘Sinhala’ story as per the derivation from the integrative thrust (siv + hela) is mischievous and even obnoxious. It cannot help reconciliation. The Indians got it right. India, since Independence, has re-named those states that had colonial names. That’s recovery as well as assertion of pride in history and heritage. Pre-colonial names have replaced the colonial names of cities; 13 in Andhra Pradesh 3 in Assam 5 in Gujarat, 2 in Himachal Pradesh, 2 in Goa, 13 in Karnataka, 18 in Kerala, 11 in Madhya Pradesh, 5 in Maharashtra, 2 in Puducherry, 4 in Punjab, 2 in Rajasthan, 13 in West Bengal, 7 in Telangana, 6 in Uttar Pradesh and 14 in Tamil Nadu. The Indians got it right. We got it wrong. We never had anything called Sinha-Le. We had and are ‘Sinhale’ and that’s not about those who speak the Sinhala language or think of themselves as being Sinhalese who are different from Tamils, but about a history of embrace, of accommodation, respect and cultural cross-nourishment. That’s far more wholesome than ‘Lanka’ (with or without the ‘Sri’) or the corrupt ‘Ceylon’. Names are important. They are political. They are about assertion and they can be about chauvinistic strutting (or read as such) as in the case of ‘Sinha-Le’. Their erasure (e.g. the marginalizing, footnoting and summary dismissal of ‘Sinhale’ or ‘Sinhala’) is about violation and violence. Therefore anyone interested in reconciliation and nation-building exercises that make for unity and dignity has to object to both the butchering of ‘Sinhale’ in its Sinha-Le fracture as well as its attempted dismissal by the likes of Jehan Perera. Sinhale-bashing in the guise of Sinha-Le bashing is out of order. Will not help. We are about to celebrate 68 years of ‘independence’ (quotes deliberate). If post-war reconciliation is about recovering identity, dignity and embrace, then we need to revisit our names. ‘Sinhale’ is and will continue to be relevant. Its corruption should be resisted. We should change the name back to Sinhale as this will remove the political overtones. I would suggest the same. A translation in Sinhala in the Sinhala newspapers, perhaps? Thank you for an informative article Malinda. Hope a translation gets published not only in the Sinhala but also in Tamil newspapers as well. Majority of Sri Lankans (all races) are reasonable people so this article would be very useful in negating the false propaganda that some politicians and NGOs are spreading.